October, 2017. Reading and Book Signing. He snored so loud it rattled me awake, made me roll onto my side to prod him. Where I was I could not have said, for my mind was still thick with sleep. Instead of my husband, our two babies lay beside me in the dark beneath a tumble of covers. For a long moment I could make no sense of the room, from one stunned heartbeat to the next. Then I knew I would never again wake in our cottage with Sam beside me, snoring. My bairns and I had returned to Fort Neck Inn, were sleeping in the bedroom Angus, Bet, and I had shared when just wee. A folded pillow over my ear hardly blocked the din. I turned away from Lucy and Jack. Harry Jagger, sister Bet’s husband, snored loud enough to wake the dead, as Papa would say. No doubt Wally Rentoul wasn’t getting much sleep in Heaven. I must have dozed because when I woke again, the washstand and wardrobe stood out in the gloom. Raindrops plunked on the slant roof above my head, soon turning to steady drumming. More rain. Ach, but the downpour would save us from having to walk to Sabbath meeting. Mother liked to say of a Sunday morning that the Sabbath was a day of rest for neither women nor innkeepers. How many years since I’d thought of rainy mornings in this room, with Angus standing tiptoe on the bed to lay an ear against the ceiling’s slope? “Listen to how the rain things!” He spoke with the softest of lisps on his “s” sounds, saying “things” for “sings.” But even so, few boys dared make fun of him since he could aim words as though they were spears. Once he told an incautious teaser, “Aye, ’tis called a lisp. So had the great Greek orator, Demosthenes. Pray, what can be the reason ye are such a pudding-head?” Our laughter silenced his tormentor. The rain had me thinking of childhood rhymes, those same ones Bet and I liked to teach our own kiddies. “’Tis raining, ’tis pouring, the old man is snoring.” The one I’d always loved best, until now—“Little drops of water, little grains of sand, make the mighty ocean and the pleasant land”—had me weeping into my pillow, for I could not help conjuring Sam and his shipmates at the mighty ocean’s bottom, waving like kelp in the stream. Never before had I given thought to a poem Angus liked to recite, “Full fathom five our father lies; of his bones are coral made.” Schoolmaster Bunce had once shown us a piece of coral, and I’d shuddered to think whose father’s bones had made it. Now I knew. The thirteenth of September in the year seventeen hundred and sixty-eight, marked the day that forever closed the road I’d been gaily traveling. ’Twas the mid-morning of my life—I was not yet out of my teens—and already had suffered the loss of Papa, and before him my brother Angus. That dear Sam would bring such sorrow to the afternoon of my life was something I could never have imagined. Before I married him, Bet liked to tease me, predicting “Ye’ll have to cook and wash and clean and garden, with a wee baby on yer hip. And they cry all night.” She was barely fourteen, so what did she know? I’d done the work of two since my youngest years, my load of tasks doubled because I’d willingly taken on a portion of Angus’s chores. I say willingly only in the sense that had I not, I would’ve been shut out from our band of warriors battling against the Gauls—whoever they were—and nincompoop yahoos we always bested. Angus knew of these enemies and others, like the trickish Trojans, from books lent him by Schoolmaster Bunce. “How I wish I was free to finish that Macedonian war. Alas, Papa says I’m to muck out Clover’s stall, check the roost, gather eggs for Mother, and haul wood. Maybe tomorrow . . . .” Since Angus had to be there if I joined the Graysons, Jessups, Smith boys, and Billy Weekes in battles, I always did my brother’s bidding. The inn had become my Newgate Prison, and constant toil, its chains. With Sam I was in the throes of young love, and we had the best of health and more than enough vitality. Never once did I tally the grueling hours spent keeping our small family warm and fed. I was no daughter, granddaughter, and great-granddaughter of innkeepers without possessing the hard-working, God-fearing blood of my Scottish ancestors. Indeed I was proud to be kin to Angus Rentoul, grandfather to my own father, who had built up the inn in 1703 from nothing. Before setting foot on Long Island, auld Angus was himself from a line of Scottish innkeepers stretching back generations. I held my destiny to be other than living out my years in a bay shack, scrimping under the baleful eye of Pa Vernal, a tyrant who reigned over the lives of his sons and nephews. Sam and I planned to move off the neck, perhaps in time open a wee public house in the town of New Jerusalem. That September morn will burn forever in my mind just as an image stays bright before the darkness of shut eyes. As he had done each day before that, Sam dressed by the hearth, quiet not to waken our children. When I placed his porridge before him, he grabbed my waist-length braid, by firelight bright as buffed copper. Coiling it ’round his hand he drew me to him, smacking me on the lips before letting go his grasp. “Now wife, let’s have no more o’ that this morning.” He was chuckling but beyond him, outside a window as narrow as a slot, a slash of crimson dawned under a ridge of sooty cloud. “Maybe ye won’t be going out today . . . and just as well if the weather’s changing,” said I, my gaze skyward. Sam hoisted his gear and headed for the door. The others would be waiting for him, and the clouds were sure to pass. “Kiss me again, sweetness, and here’s two for Lucy and Jack when they wake.” His boots rang down the planks amid greetings to his brothers and cousins eager to take the Johanna out on a following tide. We were in the season of smoking, salting, and pickling part of our catch along with shellfish the bigger children hauled in from the bay. “Mackerel and blues be running, boiling our waters,” croaked a codger to his cronies, lined up on a cedar bench against the boathouse. Shucking oysters for smoking was hard work, freezing yer hands even in late summer. I’d stay down by the wee beach on the bay’s edge just a tick longer, the drone of the men’s speech weaving in and out of hearing. As I was neither born nor bred on Seamans Neck, to these ancients I might as well not have existed at all. My bairns were a different tale, for they were Vernals. “Watch that little one, missy, afore he drowns in a wave,” called one, though there were no waves, and I was standing right beside Lucy, Jack on the grass between my legs. These baymen whiled away their days studying the skies. “Warm for September,” one cried above wind and clouds charging in from Connecticut way. At the shoreline cedars and willows were thrashing, gusts now chilling me through. Just before the splatters hit, I somehow got the kiddies safely into our cottage, slamming its door as lightning forked against a sky as black as midnight. Rain fell as though in Heaven leathern buckets were dousing cloud fires. During the storm I laughed and sang so the kiddies would feel no fear, and soon enough the worst of it passed. In its tracks cold drizzle blew for most of the day. Now, we’d expected the men’s return by early evening though I recalled times when they sailed into the bay by lantern light. ’Twas dusk when a sister-in-law stopped by our cottage, her children in tow. “I won’t go to the Big House just yet,” she said, blowing to cool the mint tea I’d poured her. “Want to be near the wharf when they come in.” Together we peered in the direction of the cut through which the Johanna would sail, on any day a doomful patch where ocean waves and bay tides clashed. Her forehead creased with worry, so I said, “Well, and no wonder the lads are not back yet, with all that blowing. Wouldn’t be surprised if it takes the whole day, and maybe a bit more, for them to come home.” She prayed the wind be to their backs. “Aye. To their backs or howsoever, as long as they return to us hale.” She’d left off drinking and at my words stared into her cup. The men were away that day and night, and the second day as well. On the third, Charles Vernal, the one brother who had stayed home to nurse his catarrh, declared himself well enough to ride out with a neighbor to ask after the boat and its men. From Raynorstown to Brooklyn, and even to the wharves at Manhattan, no one had heard of the vessel, or of any shipwreck. By noon on the day of the storm, all boats in the harbor at New York were moored, sheltering against blasting winds and surging tides. My blood lacked the ready fear seamen’s wives possessed, for it took days before I told myself Sam wasn’t coming back. One sister-in-law lost all reason, and was taken away to her people in town. Her claims that God had come in a dream and assured her the boys would soon be sailing in, were more than Ma Vernal could bear. The family planned a memorial—there could be no burial—and everyone from three towns would be there, for who did not know the Vernals in some way? And if they did not, they knew well enough other baymen who had gone missing in some other storm. First out of bed made the fire, so ’twas I banking the coals, glad when an ember flamed the tinder. The gloaming called for a lantern but I fed the fire instead, then roamed through the inn, dawn starting to brighten the taproom and dining room. As all grew sharper in detail, I could not help but note the rooms’ shabbiness, even as my nose filled with the friendly reek of tobacco smoke and sour ale not yet aired from the night before. These smells strangely comforted me, yet my gut churned at each broken chair slat, the unpolished floor, the countertop clotted with beer and crumbs. Most unsettling of all, Papa’s prized mirror—as tall as a man and nearly as long as two—was cracked in the corner. Oh, Papa! Stepping through the kitchen to the mudroom where we stowed our kegs, the prospect seemed no better in the backyard. An overgrown lawn, a weedy kitchen garden, and the herb patch, tangled from neglect. Beside the barn the chicken coop stood empty, eerie in its silence. Mist caught in the willow fronds just beyond Heron Creek where Papa kept his hives. Fog hid them, but the breath caught in my chest—were they, too, gone? Some Fun Facts—Geographically Speaking . . . 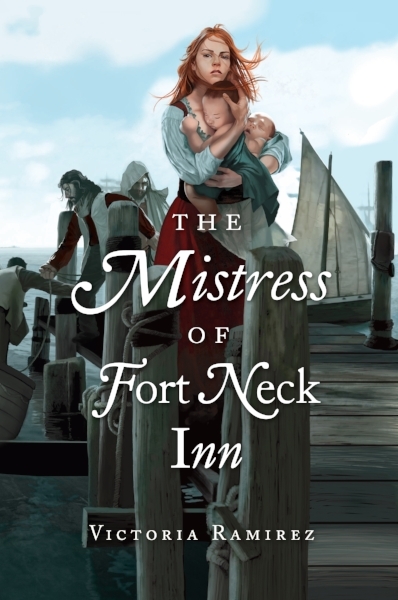 Readers of The Mistress of Fort Neck Inn familiar with Long Island may be interested in learning the present-day names for towns in the late 18th Century. As mentioned elsewhere in this site, Massapequa was called Fort Neck, which historians claim was due to the Massapeag Indians’ building a fortress near the shoreline. The fortress, built as a palisade stout enough to protect those within its sheltering walls, saved local Indians from attacks launched by Connecticut’s Pequot Indians in their huge dugout canoes. Scholars attribute the raids to the Pequot Indians’ desire for the richly-hued wampum the Massapeag created from local quahog shells. As the shoreline eroded, the fort ended up in Oyster Bay, where its fallen timbers could be spotted many decades after the Massapeag no longer inhabited Long Island’s south shore. Jerusalem South is present-day Seaford, while Raynorstown is Freeport. Huntington South is now called Amityville, while Island Trees became Farmingdale. The “barrier island” mentioned in the story is the sandy spit of land between the Atlantic Ocean and the Great South Bay. Long Island’s famous Jones Beach comprises part of that island.